Extreme Live Gaming’s raison d’être is innovating the Live Casino experience, which works out well for us as we get to enjoy groundbreaking games like Great Rhino Roulette Live Casino game. Combining the best of live roulette with slots against a Savannah backdrop, we get the chance to enjoy side bets slots-style, all while enjoying the great animation and visuals from Extreme Live Gaming’s counterpart slot. Great Rhino Roulette is a fully immersive live casino experience but unlike other live games, this one comes with a difference. Rather than just being broadcast from a bland studio somewhere in London, this one gives breathtaking views from the moment you take to the table. And we’re not just talking about the Dealer. With the Roulette table taking pride of place in the middle of the screen, in the background the Serengeti teems with exotic wildlife. 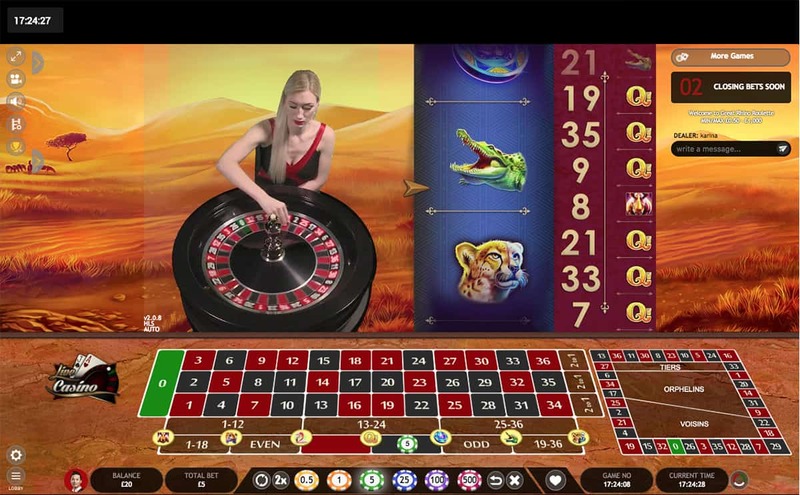 To the right of the screen we have the single reel which delivers the hybrid Roulette/slots experience. We get some of the popular symbols from the Great Rhino slot, including card values and wild animals such as the Flamingo and Hyena. To the right of the screen we also have an additional racetrack to help us with our betting strategies. It might seem like a lot of onscreen presence, but it’s not as busy as a watering hole. Everything works well together to create a more vibrant Roulette experience, with more colour, action, excitement…and of course winning opportunities. Great Rhino Roulette is based on the European variation so we can expect the usual rules along with just one zero pocket and numbers 1-36. As well as placing our bets on the roulette table itself, we also have the option to bet on the slot aspect of the game. It doesn’t work like other slots where we have to create a winning combination, instead it does work more on a roulette basis. For instance, we can place a bet on one of the symbols and when we spin the roulette wheel, the slot reels spin too. If the reels land on our symbol then we win. Simple. All while we’re playing we get to interact with the live dealer using the chat function and enjoy real-time gaming at its best. We can use the game statistics on the side of the screen to see which numbers have recently come up and use it to adjust our betting strategy. Extreme Live Gaming lives up to its name. If it’s going to be a live game, it’s got to be extreme. And Great Rhino Roulette certainly is both. 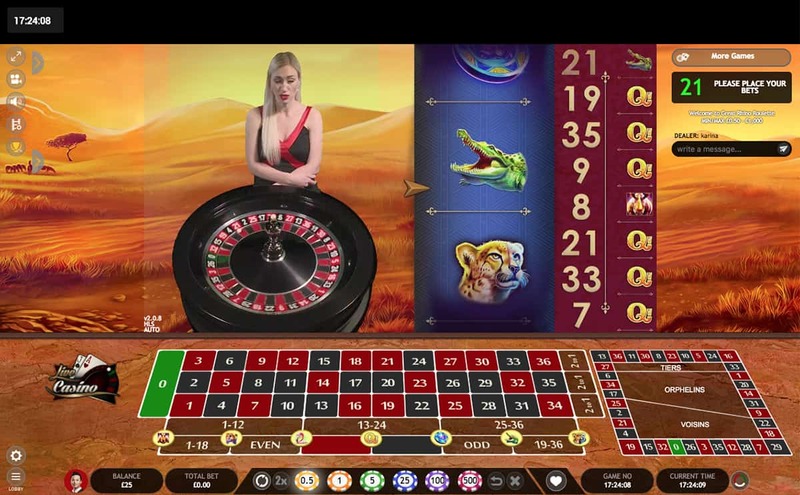 The added slots game is an extra enhancement to what is already a superior version of Roulette and the amazing graphics really do make us feel as if we’re playing Roulette right inside of an African national park. While we wouldn’t advise doing that for fear of getting eaten by lions, we’d definitely recommend taking Great Rhino Roulette for a spin.